Open to the public for a fee, it allows petrolheads to explore the potential of a Boxster/Cayman or 911 and visit the Porsche factory too. Porsche owners – we’re referring here specifically to those with a 718 Boxster/Cayman or a 911 – are fortunate enough to have in their garages some of the planet’s finest handling sportscars. Thing is, they don’t get to exploit the full capabilities of their car in real-world conditions. There are speed limits, other road users and one’s own safety to consider, which means the real dynamic potential of these vehicles remains largely untapped. But all is not lost. The hallowed German sportscar purveyor offers a range of track experiences that not only scratch the need-for-speed itch, they also stand to make you a better, safer driver – not just on the racetrack, but also in everyday conditions. 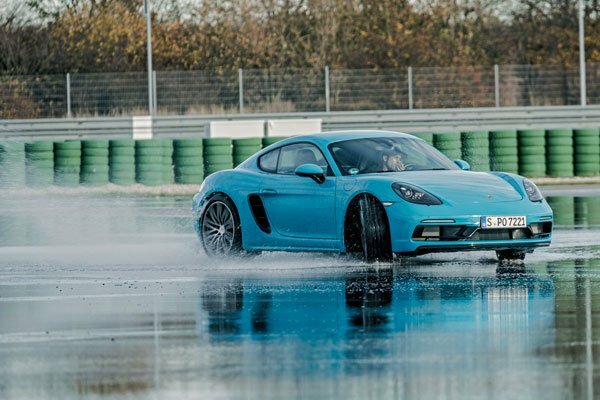 To find out more, we signed up for the ‘Warm-up Porsche in Leipzig’ Experience to get a first-hand taste of what one stands to gain via these courses. For those who may not know, Leipzig is a city in the eastern part of Germany – not too far from the Polish and Czech borders – and it’s where Porsche has a factory that builds the Macan SUV, as well as the Panamera sports saloon. Right next to this production facility is an FIA-certified test track that’s been designed to incorporate some of the most famous corners from circuits around the world – including an exact replica of the steeply banked Karussell from the Nurburgring Nordschleife and the iconic ‘S’ curve from Suzuka. Today we’ll be going through a range of driving exercises to instil a greater sense of car control at the limits of adhesion, as well gain an understanding of how the vehicle’s behaviour changes on a low-grip surface (ie a wet skidpan) and the significant effect of the car’s weight shifting when you brake or accelerate heavily or feed in any sharp steering inputs. You may be surprised to learn the instruction commences with an in-depth explanation of the correct seating position. Now, you may think sitting in a car is a no-brainer, but it’s surprising how many motorists get this wrong. Ideally, you need to be positioned close enough to the wheel so your elbows and knees are both bent, enabling you to exert enough leverage even under racetrack conditions. It also means that impact forces won’t be transferred through to your hips and shoulders in a crash – as would be the case if your arms and legs are extended straight out to the wheel and pedals respectively. Suitably schooled on how to sit, we head out to the track with the instructors and dissect the trickiest corners on the circuit to glean the ideal cornering line. The key is to effectively make each corner as straight as possible by using the full width of the track on entry and exit and hit the ‘apex’ in mid-corner. Later on, we head out for some quick laps behind the instructor, who leads the way in a 911 GT3 pace car, and we attempt to copy the exact line he’s using. Our mounts for today are the 718 Cayman and Boxster range, as their sublime chassis balance makes them the ideal vehicles for honing our basic track skills. The day also incorporates a slalom exercise around a course marked by witches’ hats – great for cultivating smoothness and finesse behind the wheel – and a session on a soaked skid pan where we try (unsuccessfully) to hold the car in a continuous drift around a circular course. By the end of the lengthy track session, each participant leaves with a much greater understanding and feel for how to make a Porsche go around a circuit as quickly and safely as possible. To round off the day, we embark on a guided tour of the Leipzig production facility that rolls out the Macan and Panamera. If you’ve never been to an automotive plant, it’s a real eye-opener to see humans and high-tech robots working in unison, magically crafting entire vehicles from thousands of components. It’s a mesmerising experience, all the more so because the Porsche plant is spotless. You could just about eat off the floor. Prices for the Porsche Track Experiences start at EUR 991 (Dhs4,131) for the type of course we completed, but if you want to take it further and elevate your skills to a higher level there are plenty of more advanced courses on offer. Next up from the basic course we did is the two-day Precision Porsche in Leipzig Experience, which will cost you EUR 1,600 (Dhs6,670) plus an additional fee for car rental – starting at Dhs5,835 for a model from the 718 Boxster/Cayman range, rising to Dhs7,500 for a 911 Carrera or Dhs15,000 for a 911 GT3. And you don’t necessarily need to go to Germany as there are 19 Porsche Track Experience centres around the world.